A lack of precipitation in Ontario the past two months has made for an interesting start to steelhead season. Periods of stellar fishing have welcomed us between windows of good water conditions following sporadic rain. However, low water has action slower than last fall. Mild daytime highs have also kept the rivers warm throughout October. This is another factor that’s kept steelhead in Lake Ontario and from migrating up our rivers. Meanwhile, I’m optimistic the number of steelhead in our Southern Ontario rivers will improve. The key is rain. More rain before New Years will draw new fish upriver before ice over. 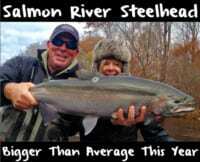 The recent cool down has helped draw fresh steelies into our rivers the past few weeks. Nevertheless, the fewer fish hasn’t affected pressure. Shorelines have been busy as salmon anglers are switching over to steelhead. Steelhead can be found in almost every major tributary that flows into our Great Lakes. West of the GTA, rivers like the Humber, Credit, Bronte Creek, Port Dalhousie and the Niagara are starting to see good runs. If you are fishing east of the GTA, the Ganaraska, Cobourg, Bowmanville, Wilmot, Oshawa and Duffins Creek have some great fishing although the size of these rivers are much smaller. North of the GTA, Georgian Bay rivers such as the Beaver, Bighead and the Nottawasaga are producing good runs of steelhead. The best bite has been on days where the rivers are falling and clearing. This is when pink and chartreuse quarter-size bags have produced. Silver, fresh-run, aggressive steelhead haven’t seen any pressure when entering a river system. Therefore, there is no need to go overboard finessing baits. 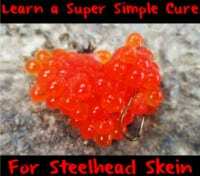 When steelhead fishing my favourite bait is Orange Fire Cure roe. However, Natural or Pink Fire Cure is best during gin clear (natural) or dirty water (pink). Many anglers also use Natural, Orange and Pink BorX O Fire cured roe. The recent high pressure forces us to downsize baits. When there’s a lot of anglers out dime size (or smaller) spawn sacs tied in peach, light yellow, or white spawn meshing are most effective. It’s important to use smaller floats and hooks, too. Light leaders and small floats help mimic a natural bait in the current. This results in more hooked fish when steelhead get finicky. *When fishing slow water use a long fluorocarbon leader. In fast water a short fluorocarbon leader is better. Long leaders in slower water give a natural sway to your bait in a deep, slow current, whereas a short leader will make your presentation appear unnatural. Short leaders in fast water allow your bait to get down in the strike zone quickly, whereas long fluorocarbon leaders have trouble holding your bait in the strike zone. I don’t use split-shot sinkers on my fluorocarbon leader and use 4-6 lb fluorocarbon. *If you don’t need to cast far use a light float. Meanwhile, large rivers and heavy current require heavier floats to get gear in the strike zone. I use 3-25g CoolWaters fishing floats. *Keep a good stock of hooks in various sizes. (#4 – #10 for single eggs) Fish your hooks accordingly with the size of the bait you’re fishing. *Keep a good stock of various size split-shot sinkers. A split-shot pattern tapered on the mainline generally creates a natural arch under your float in the current. *Fish bait colors accordingly with the given water clarity. Dirtier water = bigger/brighter baits. Clearer water = natural/smaller baits. *Experiment! Adjust your presentation if the fish are heavily pressured. Move around. If you haven’t hooked anything at a particular spot in a half hour, or so, move to the next hole or fish a different section of the hole you’re in. Having spent a lot of time on the water, I have noticed that the anglers with the least amount of success on the water are the anglers who are generally afraid to change and experiment with their presentation. There is nothing to lose by changing your presentation – other than a few fish perhaps. Editor’s Note: Bojan Zivkovic (Bojangles) is a die hard angler based in the GTA. He lives to fish and fishes to live.